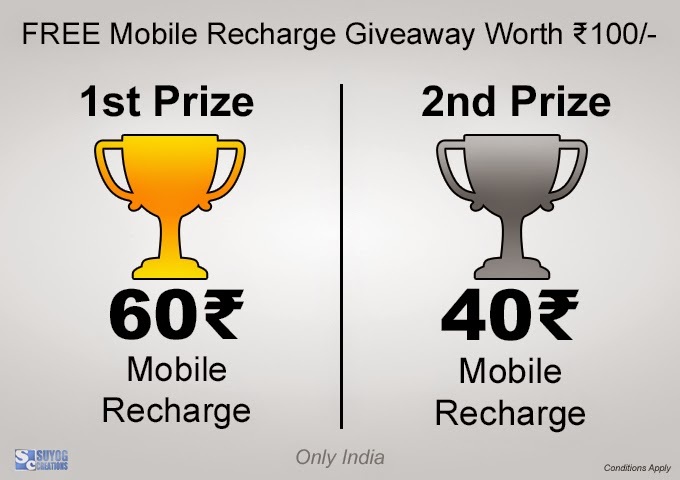 Win FREE Mobile Recharge Giveaway Contest of 100 Rupees In India. If you have seen above image carefully, Yes we are going to select 2 lucky winners and 1st winner will be getting free mobile recharge of 60₹/- and 2nd winner will get 40₹/- recharge respectively.This is nice way to check your luck. Wining chances only depends on how much entries you have. For more entries try to do everything given above and don't forget to share this with your friends because when your friend participates in this contest through your link you will get more 5 entries. Entries will be accepted till 17th May 2014 11:00 PM, and the winners will be announced On Sunday 18th May 2014 Only on Our website and Facebook Page. We will be contacting the winners personally through Email and facebook. We suggest you to bookmark this page so that it will be more easy to find it on 18th May 14, When the winners will be announced. Just go on sharing the link given to you. Earn more and more entries by doing all the tasks.